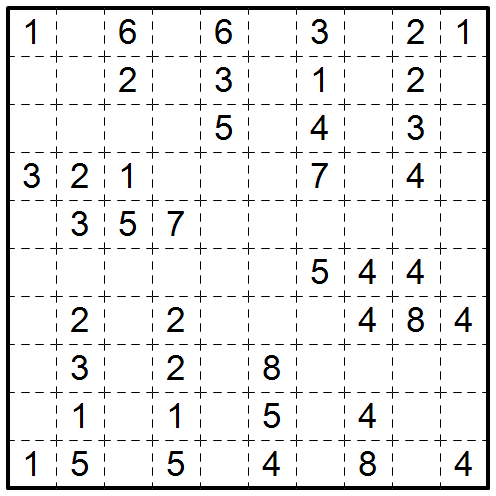 This is a Fillomino puzzle. I made this one in case we had need for a monster of a classic, which we did not. There are a couple places to apply metalogic on it, so it’s just as well. In other words, except for Sum and Greater-Than, mathgrant made the puzzle at the top of each page, and except for Cipher and Greater-Than, I made the puzzle on the bottom. This means Greater-Than flipped the usual pattern, something that a lot of people caught onto to my surprise. The fewest correct responses were provided for the hard Shikaku; only three entrants pegged that one as mine. Next was the hard Cipher, which only four correctly guessed was mathgrant’s. The winning entry by Projectyl only missed the easy Sum and hard Cipher. 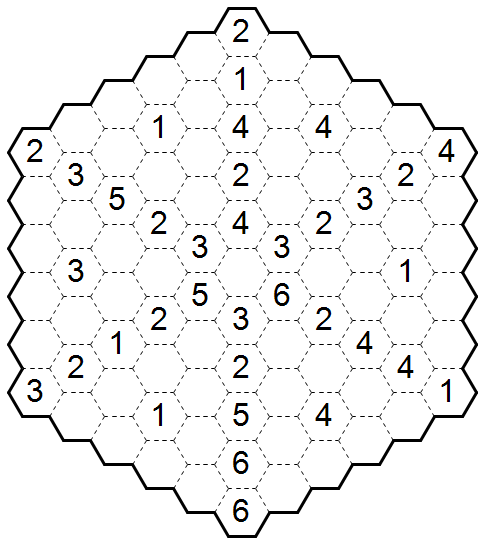 In light of that last bit, since Projectyl already got a (fairly challenging) Cipher puzzle constructed for him by mathgrant, I thought about perhaps giving him a Sum puzzle. So I did. Congratulations to him, and enjoy the puzzle. Read down the diagonal to see how his alias was worked in. 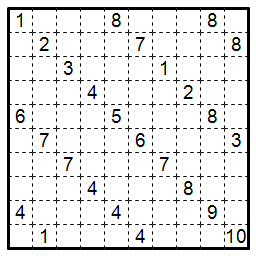 Warning: Despite the fact that it was the easy Sum that Projectyl missed, this puzzle is very, very challenging. 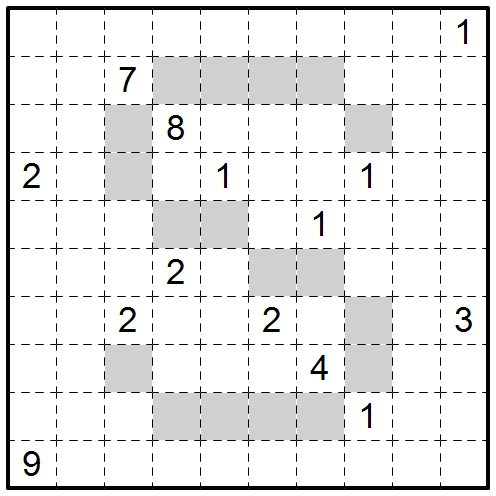 This is a Fillomino Path puzzle. 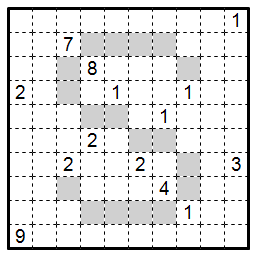 The much easier companion to last week’s Path puzzle. Again, gray squares mean the same thing as yellow ones. The S doesn’t have any special meaning; it just made for a good puzzle. 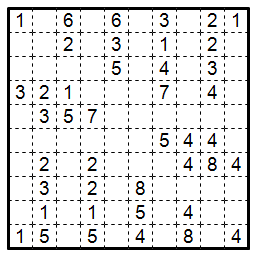 This is a Fillomino puzzle, with a twist. There are some clues on the outside edges of the puzzle. If one views the numbers in the completed grid as building heights, then a clue on the outside tells how many of the buildings are visible when looking into that row/column from that location. A clue is visible if and only if it is strictly greater than all clues before it. 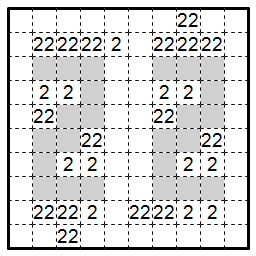 For instance, if a row reads “13235” from left to right, the clue on the left (if given) would be a 3 (13235) and the clue on the right would be a 1 (13235). This was made early before we had any idea which variations would actually be used. Neither of us ended up making any more Skyscrapers, and later we had enough good puzzles in other variations, so the variation never really entered serious consideration. It is likely a bit easier than what I usually put up on Friday, but that’s probably the case for any of the rejects I’m posting. In my opinion this is by far the best puzzle among those that didn’t get used. Including Path as a variation was considered almost up to the end, but there were good reasons to drop it. 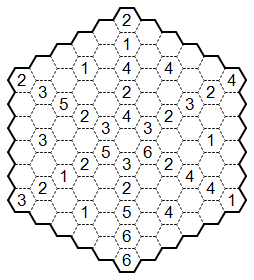 For one thing, this was the Path puzzle I was most attached to, but I wasn’t sure if it was suited for use in a competition (answer entry issues among other things). Path also had a set of directions that were much longer and more complicated than for any other variation, and this was a problem with the Zoo I was intent on correcting. 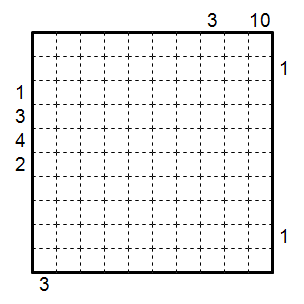 Also, this image is in black-and-white since it’s the same one that would have gone into the test PDF. 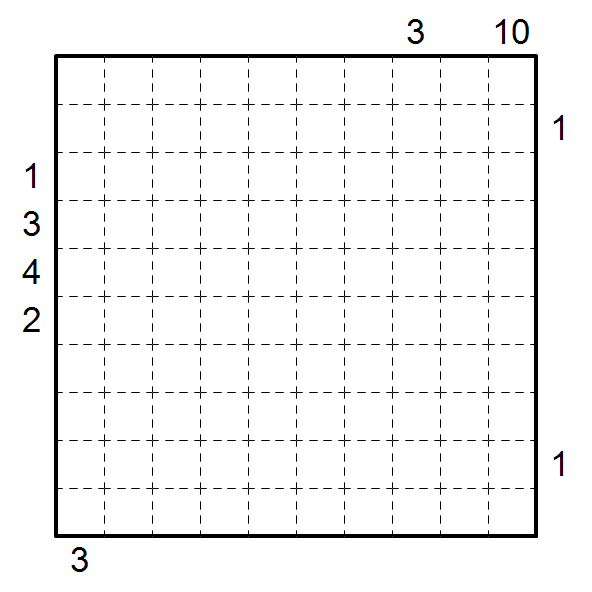 There’s no difference between gray squares and the yellow squares in other puzzles. Finally, this puzzle has the odd distinction of being constructed in very little time, around 5-10 minutes after thinking of the concept. Usually when I try crazy ideas like these I eventually realize they will never work, sometimes quickly and sometimes not so quickly. Here, the puzzle was completed before I even realized it. 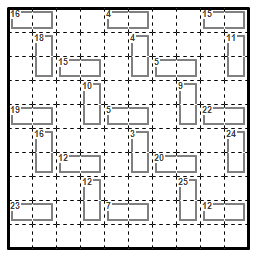 Another LMI test over, another batch of sadly neglected puzzles that want at least a bit of exposure. Before you start groaning at the thought of another reject series that will last for months and make you totally sick of Fillomino, this one will be just two weeks. This one is an easy classic that would have opened the test if it were used. Fillomino-Fillia is over + Guess the Constructors! Fillomino-Fillia, my second LMI test written with mathgrant, is now over. Congratulations to deu (H.Jo) for an incredible performance, finishing all puzzles 28 minutes early in a 2 hour test. I would not have believed that possible if I hadn’t seen it happen. Props also to motris, flooser, and uvo, the other finishers who had 11, 8, and 5 minutes remaining respectively. At any point between the time of this post going up and 48 hours from now, you can begin Fillomino-Fillia, the LMI puzzle contest written by mathgrant and I. Go here to see the instructions (if you haven’t already), download the puzzle booklet, and start the clock. You may also want to read mathgrant’s tips that can be found on this post of his. Good luck to everyone competing. 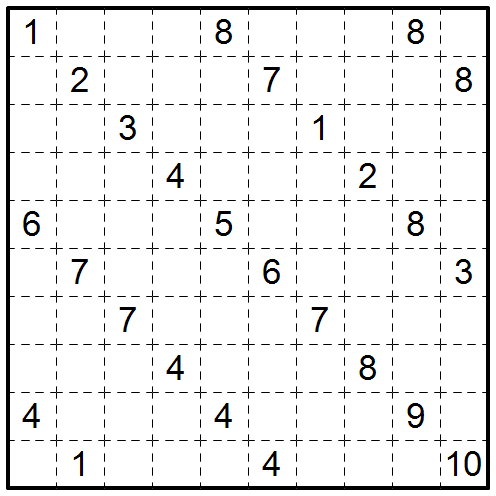 This is a Star Fillomino puzzle. 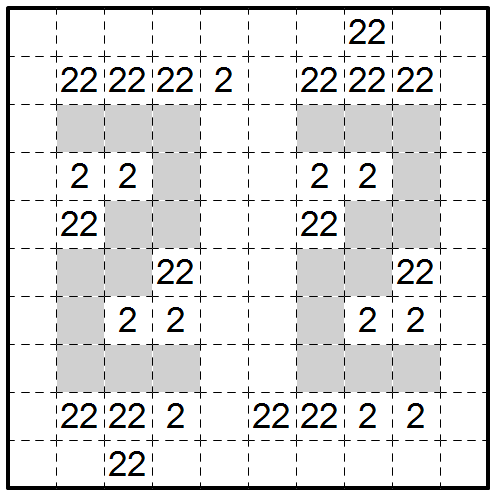 Not all of the cells will be contained in polyominoes; the remaining cells will contain stars. 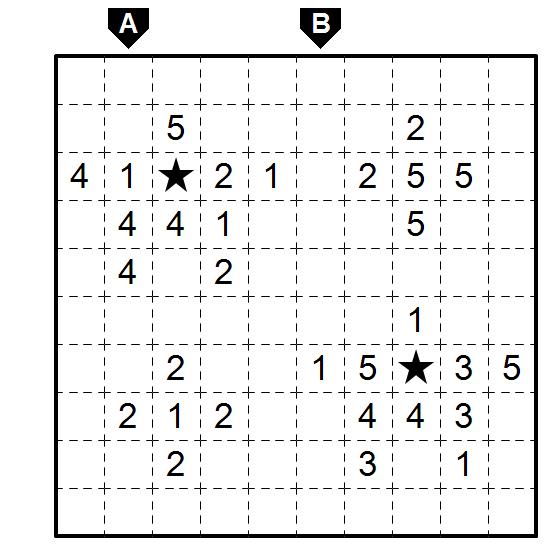 Every row and every column must contain two stars, and no two stars may be in cells which share a corner or an edge. Part 4 of 4 in the Fillomino-fillia preview series. See mathgrant’s blog for the other half. 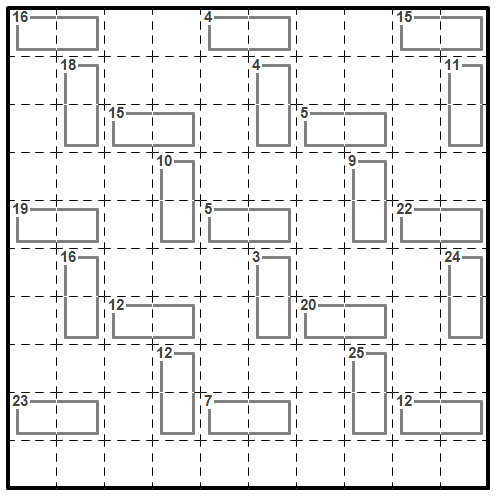 Answer Entry: Enter the units digits of each square in the marked rows and columns, from left to right for rows and from top to bottom for columns. 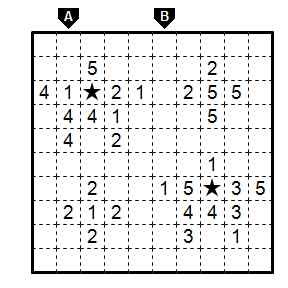 For a cell with a star, write S.
Of all the puzzles in consideration for inclusion on the test or in this preview series, this is the only one without rotational symmetry (inequality signs in Greater-Than not included). I confess it was originally an accident, but even after I noticed it the idea of one of the stars being upside down didn’t seem to work aesthetically. It comes down to the fact that the star icons themselves don’t have 180 degree rotational symmetry.